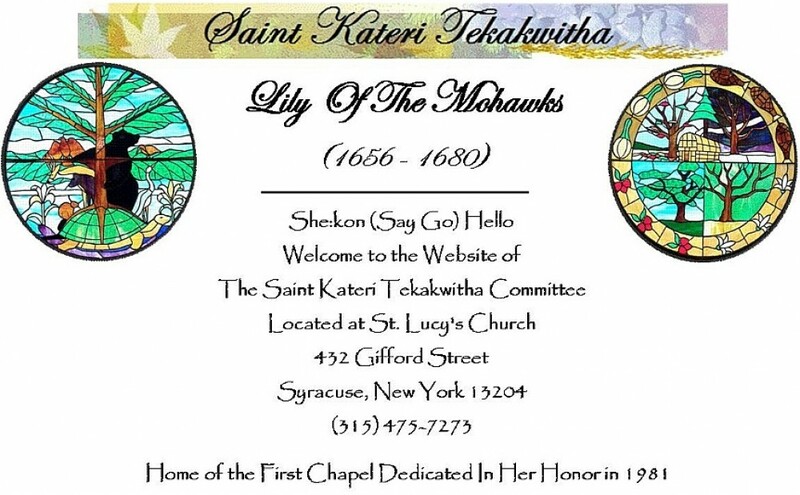 This is a Native American Liturgy Mass in Mohawk and English to honor the family, friends and loved ones of Natives and non-Natives who have passed away. A tall tree, barren of leaves is chosen and placed in the church near the altar. The names of the deceased are written on tissue paper leaves in autumn colors. Very small photos can also be attached to the leaves. A $1.00 donation for each leaf is appreciated, however it is not required. These leaves are then hung on the tree until it is completely covered transforming the once barren tree into a beautiful blaze of color. Because there are over 3000 names, the reading of the names to a soft drum beat will begin approximately 2 1/2 hours before the Mass (1:30 PM). Each name is also placed into a Memorial Booklet that is handed out with a copy of the Mass Booklet to everyone who attends. After the Mass, a Feast, that is an extension of our Mass, is held in the basement dining facility of St. Lucy’s Church. Depending on the number of people expected, some of our “Feasts” are held in the auditorium across the street from the church. There is no charge for this Feast but donations are always appreciated. For more information, contact St. Lucy’s Church at 315-475-7273. Please note: During these Native Liturgies a Sacred Smoke Blessing is shared with the congregation. This consists of a pleasant smelling “cleansing” smoke (in minimal amounts) from a mixture of Sweetgrass, Sage and Cedar that is fanned with feathers to carry our prayers to the Creator. If you have asthma or other allergies that would be provoked by this smoke, please let someone know and they will try to make accommodations for you. The St. Kateri Committee is blessed with a 1st Class Relic of St. Kateri Tekakwitha. This Relic will be made available with a committee member in the St. Kateri Chapel after the Mass for anyone who would like intercessions through the Relic. The Chapel is located in the room off to the right of the main altar. Committee Coffee Hours are held on the second Sunday of each month. There is no charge for the coffee or baked goods however donations are gratefully accepted. Bake sales are also held intermittently throughout the year on the second Sunday of each month. They are held in the basement of St. Lucy’s Church following the 9:00 AM Sunday Mass. Food items include: Pies, Cakes, Muffins, Cupcakes, Cookies, and the all time favorite, Brownies. Christmas Cookie Sales will be Saturday, December 15 & Sunday, December 16 in the back of the church after Mass. The cost will be $15.00 per tray. Please check their website at http://www.martyrshrine.org for updates. This is a very family oriented “DRUG-FREE & ALCOHOL – FREE” Powwow. Join in the fun of traditional Native American dancing, crafts and food. Here is your opportunity to experience the taste of Buffalo Burgers, Venison Stew, and Indian tacos. (Non-Native food also available). Journey back in time with Tribal dancers dressed in traditional regalia as they entertain you with traditional dancing such as The Crow Hop, Sneak Up, Two Step, Shawl Dance, Jingle Dance and Switch Dance, to name a few. Take part in the Inter-Tribal dancing, the Veteran’s Dance, the Snake Dance and the special Children’s Candy Dance in the circle around the Sacred Fire. No dance experience needed, just move your feet to the beat of the drum(s). At each day’s opening ceremony, we honor all Veterans with a special Honor Song and Dance. All Veterans and family members of Veterans who have lost a relative, loved one, or friend from WWI through to the present conflicts are invited into the circle so that we may honor them for their sacrifices. These dances allow Natives and non-Natives to come together to experience the fun and camaraderie of the powwow. Copy of poster and directions will be added at a later date. This is a Native American Liturgy. A Mass Booklet with responses in Mohawk Phonetics and English is available to the congregation so everyone can participate. A Feast/Reception (gratis) which is an extension of the Mass follows in the church basement dining facility. Our committee is blessed with a 1st Class Relic of St. Kateri Tekakwitha. This Relic will be made available with a committee member in the St. Kateri Chapel after the Mass for anyone seeking intercessions through the Relic.